Arthur Bowen Davies was born in Utica, New York, but his family moved to Chicago in 1878 when Arthur was still in his teens. The young man soon afterward went west, working as a civil engineer in Colorado and Mexico. Upon his return in 1882, he attended the Chicago Academy of Art. In 1885, Arthur moved to New York City, where he studied at the Art Student’s League and the Gotham Art Student’s League, while supporting himself as a billboard painter and a magazine illustrator. His first major exhibition was in 1888 at the American Art Association. The first of Davies’ many trips to Europe came in 1893 under the sponsorship of William Macbeth. The trip began a life-long interest in the European avant-garde. Three years later, Macbeth gave Davies a one-man show, and in 1908, Davies exhibited at Macbeth Galleries again, this time in company with Glackens, Henri, Luks, and “The Eight.” The artist remained abreast of artistic developments in France, and he was one of the principle organizers of the 1913 Armory Show, which brought the major figures of French Modernism, including Braque, Duchamp, Redon, Matisse, and Picabia, before the American public. He was one of the first artists whose work Duncan Phillips methodically collected, and he assisted Alfred Barr, Jr. in the formation of the Museum of Modern Art. Despite his associations with the Ashcan School of urban realists and with the developing abstraction of European Modernism, Davies style remained, for the most part, aloof from both. 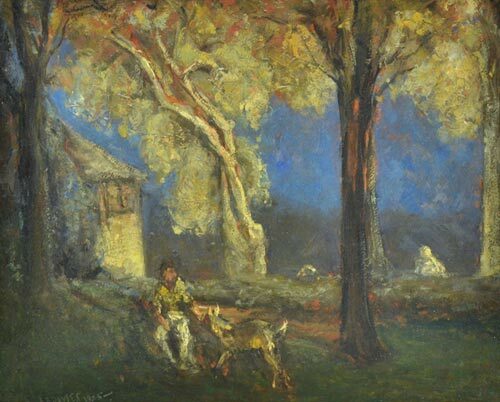 Although he flirted for a time with Cubism, his own style might best be described as Tonalist backgrounds overlaid with symbolic or mythic figurative content in the manner of Puvis de Chavannes or Albert Pinkham Ryder. As such, Davies is an important transitional figure in the progress from late nineteenth-century Tonalism to American Modernism. Davies’ importance in American art history is probably best attested by the vast number of museums holding his work. These include the National Gallery or Art, the Museum of Fine Arts, Boston, the Worcester Art Museum, the Brooklyn Museum, the Los Angeles County Museum of Art, the Metropolitan Museum, the Philadelphia Museum of Art, the Smithsonian American Art Museum, and the Phillips Collection.